Through an extremely in-depth report, paired with dazzling visual representations, design and think tank group Rollerhaus imagined an eco-centric future vision of Chicago that is without cars, with new systems for energy and water, and built in a whole new architectural language. Their project was started in response to the Living Future Institute’s Living Cities competition, whose challenge was to conceptualize what a city of the future may look like if it work like a certified Living Building. Their interpretation of a reclaimed eco-architecture city — featuring reused parts of building facades and billboards pieced onto skyscrapers — drew a lot of controversy, but we echo Rollerhaus in their proposal, which begged the question: Is a sustainable city really the picture perfect one we’ve seen in past architectural movements? Rollerhaus reference cities in India and Egypt that have tight knit, extraordinarily efficient communities built from the waste of others. Although some would call these slums built from necessity, Rollerhaus poses that in the future sustainable architecture may take a cue from this makeshift aesthetic. Another highlight of Rollerhaus’s in-depth project was their suggestions for how Chicago could produce and conserve energy in the future. The outline looks at portions of energy coming from many sources such as wind farms, ground source heat pumps, and solar building retrofits. There is even a suggestion to put a glass box cap on some skyscrapers as a way to allow glass lined photovoltaics, and create greenhouse spaces. The visualization that suggests another huge change to city dynamics is one where the streets are no longer corridors of vehicles, but are entirely green space transit routes above ground with public transit sub structures. It is very impressive to see a Chicago dominated by park and pedestrian space, but without lose of efficiency of getting around. Being able to travel primarily below ground during the chilly winter months would always be a great benefit. You can see the full detailed report from Rollerhaus on their website. We also must mention that their amazing renderings were recently awarded Best in Show in the KRob competition. Through an extremely in-depth report, paired with dazzling visual representations, design and think tank group Rollerhaus imagined an eco-centric future vision of Chicago that is without cars, with new systems for energy and water, and built in a whole new architectural language. 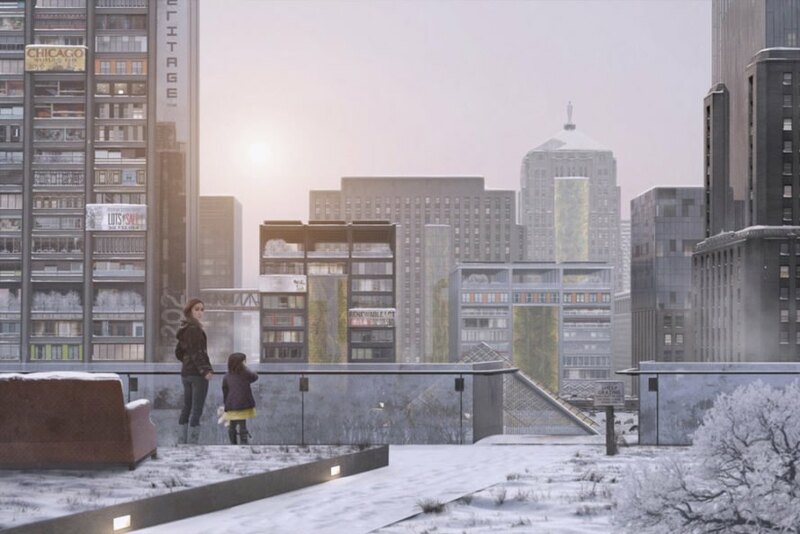 Their project was started in response to the Living Future Institute’s Living Cities competition, whose challenge was to conceptualize what a city of the future may look like if it work like a certified Living Building. Their interpretation of a reclaimed eco-architecture city -- featuring reused parts of building facades and billboards pieced onto skyscrapers -- drew a lot of controversy, but we echo Rollerhaus in their proposal, which begged the question: Is a sustainable city really the picture perfect one we've seen in past architectural movements?